A couple of comments have come in on my last post remarking that this way of designing a yard (inspired by Planting in a Post-Wild World) seems really complex. And I’d say to that, it is! And yes, it’s kind of a pain to figure out. But (fingers crossed) I think it is a worthwhile thing to do. What I’m talking about here is moving from seeing our yards as outdoor rooms, and our plants as furniture to be arranged and re-arranged at a whim. Instead, I’m talking about seeing our yards as communities, or as systems. You can pull a chair out of a living room, or paint the walls a new color one day, and these changes won’t effect the the other furniture. In a living system or community, though, changes to parts of the community ripple through the whole community. Both of these ways of thinking are, to go back to the first simile, very much like doing interior design. I need a curtain for this window. I found a great clock at a swap meet, and now I need to fit it into the living room. In approaching planting this way, I’m pretending that plants are inanimate objects subject to my will, and I am placing my needs ahead of theirs. Sometimes this approach “works” and the yard looks good. What this means is that I make some right calls and the plants play along. Sometimes it doesn’t work, and the plant dies, or fails to thrive, or conversely, grows unexpectedly large and tries to take over the yard. When this happens, I cast blame around, against myself for being a poor gardener, against the soil, against the drought, against the nursery which sold the plant, against the plant itself. In all cases, though, I’m considering the plant as an isolated individual, and I’m evaluating its success or failure in myopic terms. System implies something we could pick apart using logic. Community is more mysterious–it gives agency to the plants. In other words, they are doing their own thing, they have their secrets, their alliances and their agendas– and I, twitchy, chatty primate that I am, can only understand a little of what goes on in their elegant, sessile world. If I’ve learned anything recently, from books like Planting, from talking to Masanobu Fukuoka’s student Larry Korn, and from hearing Suzanne Simard speak, from studying the aboriginal idea of the kinship of all things is that we should be humble before plants. As Fukuoko-san said, we know nothing. Starting from a place of humility, I’m trying to find a new path. I’m trying to develop a new relationship with plants, and as a result, a new approach to landscaping. This is the path of the post-wild. New paths often run rough. Meanwhile, the lawn n’ shrub is a path worn into smoothness. In fact, it is a rut. This is work, but it is rewarding, because as we engage with this process, we realize that we’re a part of the community, too. Instead of being a petty overlord, mowing and blowing the world into submission, we are partnering with the life in the yard to make the world a better place. Re-connection with nature is its own reward, because lets face it, it’s lonely being a despot. Apologies for the inconvenience we’ve given all of you over the past few days. I know commenting suddenly became a huge pain. The reason was spam. 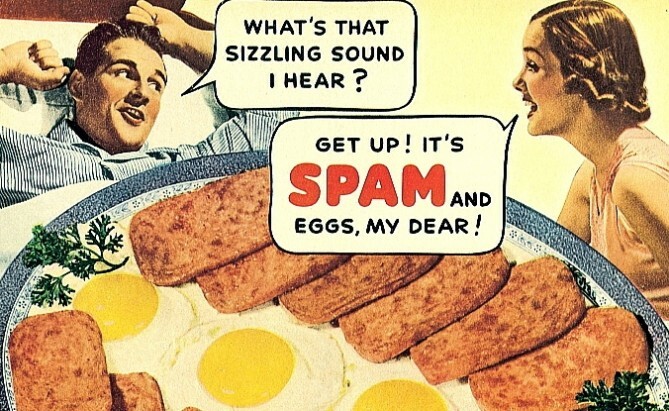 We were getting a new spam comment on this blog at the rate of one per second. (I cannot say how much I hate spamming as a business practice, and could indulge in a good long rant on the subject, but will not.) The point is that this influx was sucking up resources and getting us into overage charges territory with our hosting service. Our intrepid webmaster put out the fire a couple of days back by making it hard to comment We’ve had no spam at all as a result. That is good. But no one is happy with the draconian commenting protocols. So we’re trying something new. Now, commenting is back to our usual system, but we’re closing down comments on older posts. We have a library of 2,522 posts on Root Simple as of today–crazy, huh?– and that’s a whole lot of territory for spammers to mine. This solution not ideal, because we like how conversations continue to develop over the course of years on old posts, but on the other hand, it’s not a terrible solution, either. Our alternative is to swallow higher monthly charges and do a lot of rather expensive fussing around with the site, so we’re going to try this out for now and see how it goes. My previous post on this subject garnered so many excellent suggestions that I decided to condense all the suggestions into one big list for easy reference. In addition, I’ve added a new board to our Pintrest account called Compostable, Recyclable Homemade Holidays. I’ve started gathering projects which reflect this list. A big thank you to Bellen, fishbee, Hazel, Indigotiger, rainey, Michael and Practical Parsimony for offering suggestions! I know–the last thing Pintrest needs is yet another board devoted to holiday decorations! But I figured my standards are a little sterner than most, so it is a worthwhile project. I really want these decorations to be able to return to the earth. This means I’m avoiding paint, glitter and Styrofoam (not to mention plastic and batteries!) and I prefer things which don’t feature glue, or can use a simple non-toxic white glue. Why this obsession with natural ornaments? I like the idea of ephemeral decorations–decorations which are meant to last only for the season, maybe only for a week or two. It is more work to make decorations afresh every year, but gathering materials and making simple ornaments is an act of meditation and appreciation. This kind of work helps us slow down and reconnect with nature. This alone can be enormously calming at a stressful time, and may help us back into a more expansive state of mind. The holidays can be so loud and jangly and rushed. Just stepping back and spending some time admiring the geometry of a pine cone or the cleverness of an acorn helps cleanse the mind of all that noise. Seasons come and go. Holidays come and go. Ornaments which reflect the seasons should come and go, too. The fact that they don’t last, that they have to be savored in the correct season, is what makes them special. Also, this kind of decorating also saves on storage space, and saves the labor of packing up ornaments once the season is over. Most of these things can go to the recycle bin or the compost pile–or just to some obscure corner of nature to return to the earth. But, more romantically, they can be hung outside for the remainder of their lives: ornaments for the fairies. This makes it easier to part with them at the end of the season. Finally, these ornaments are light–they don’t burden our earth with yet more plastic and toxins. They aren’t made in some far off factory by an underpaid laborer. They are not helping the bottom line of some soulless big box store. This is broken down into two parts: the first list includes ornaments that come straight from nature, and which will only last a short time. Collect them on walks around the neighborhood, collect them as mementos of trips to the mountains, the beach, or grandma’s house. Bring them home and hang them straight up! At the end of the season, they can be returned to the earth. The second list is more crafty, requiring more input from you, and creating ornaments which you may or may not decide to keep. Cool looking seed pods ( milkweed pods, thistle heads, sweet gum tree pods, sycamore pods, star anise, Indian cigar tree pods, magnolia pods–keep your eyes open in the autumn and you’ll find lots) If you want sparkle, sugar them instead of getting out the glitter. These projects require some crafting, and some are not as ephemeral as the ornaments above–you may want to keep them from year to year. Or, they are made stuff you find in your house, instead of out in nature. If glue is necessary, use non-toxic glue. Make the yarn and cloth projects biodegradable by choosing cotton or wool yarn, and natural fiber cloth. Making little cloth ornaments is a great way to use up scrap cloth and yarn. Save colorful scrap paper for the paper projects. Gather a few evergreen branches by the branch ends to make a broom or fan shape, decorate with a spray of berries, tie with a ribbon. Much easier than a wreath! Bay leaves glued into wreaths and stars. Paper cones with raffia hangers filled with…sweets? berries? Make little creatures out of teasels, acorns, milkweed pods, etc. Make cookie-type ornaments out of a simple dough made of applesauce and cinnamon–add applesauce to cinnamon until it forms a dough. Just leave to dry–no baking, or maybe try drying in a very low oven. These smell great, and their scent can be revived by sanding them. If you want to add to this list, speak up in the comments and I’ll move your suggestions into the list. I was lucky enough to be able to camp this Halloween weekend. While I love the costumes and the candy and the gentle anarchy of Halloween in the city, I was very happy to be able to spend this Halloween out in nature. My only other nature-based Halloween was many years ago, in rural Ireland, where I wandered the countryside alone at sunset, hoping to spot a ghost or a fairy or a faun. Maybe it is just the power of suggestion, or maybe it’s something else, but Halloween night has always carried a charge for me–it just feels different, whether you’re on the street with a bucket of candy, holed up in the house with a pumpkin beer or out in the woods. It’s said that the veil between the worlds is thinnest on Halloween night, and I’m willing to buy that, because somehow the air always feels full of potential. 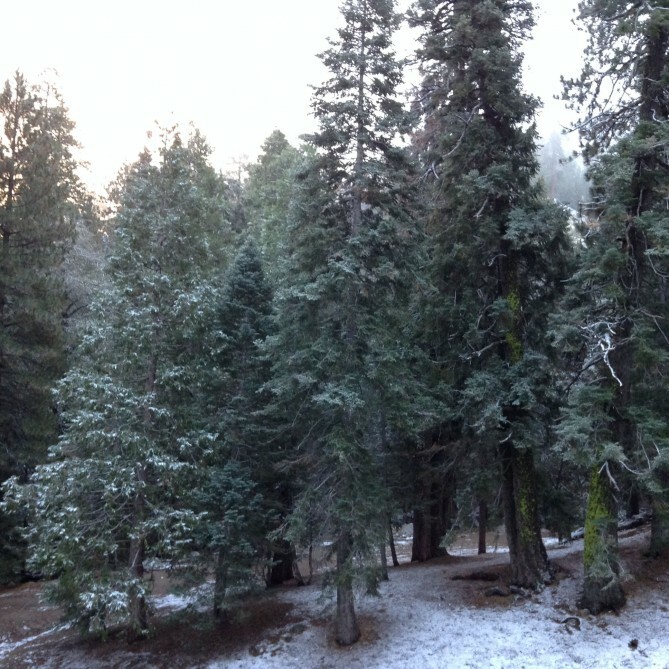 This Halloween night, I was camping at 6,300 feet in the Angeles National Forest. The weather in Los Angeles has continued depressingly hot and clear and dry, despite the arrival of autumn. On Halloween evening, though, clouds gathered in the sky, obscuring the relentless blue. Around twilight those clouds dropped. 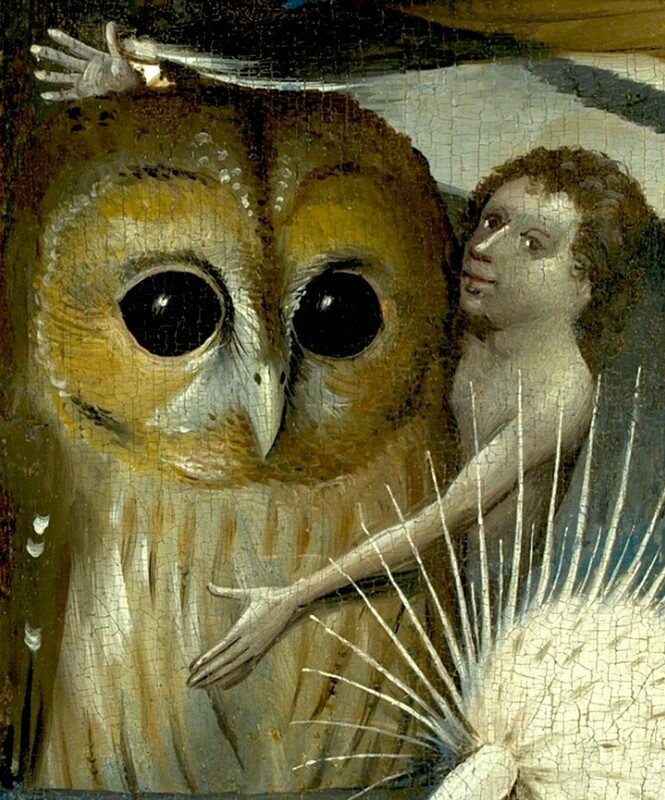 They just fell straight down from the sky, as if someone cut their strings, and they turned into a sort of high fog with feathery, creeping tentacles exploring the tops of the pines and the cypress. And those creeping clouds drifted ever lower as the light faded, and a breeze kicked up, which sent the golden leaves on the ground a-dancing. I sat by the fire, looking down a long path lined with swirling leaves, shivering bushes and tendrils of fog and waited to see a fairy, or maybe a Black Rider. Then the daylight vanished abruptly, like someone turning out an overhead light. Fifteen minutes later, I couldn’t find my hand in front of my face. Darkness swallowed everything whole. We read scary stories by the campfire and ate apples baked in the coals. Late that night, after I was safely tucked in my bag, rain started to fall. The first significant rain of the year, the first significant rain in maybe 9 months or so. All night long the wind in the trees roared and boomed–it sounded like waves crashing on rocks. The rain sheeted down on my tent while the wind shook the sides. 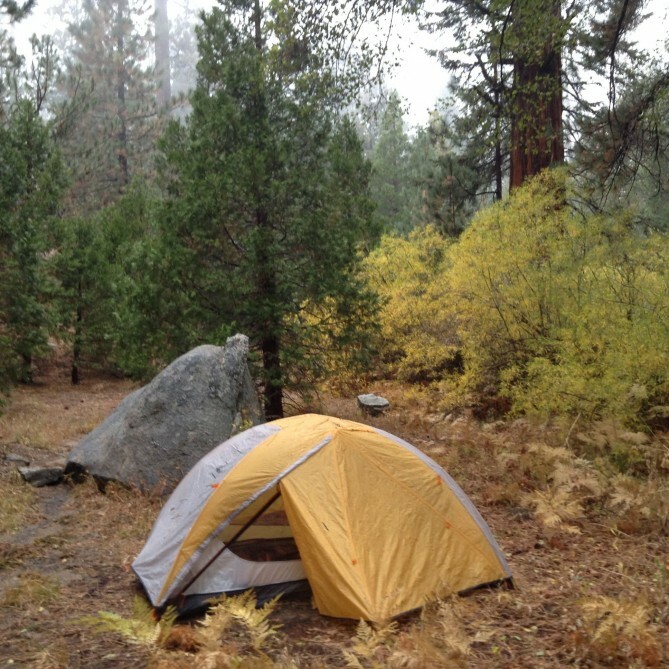 (A five year old tent which has never been tested in the rain–that’s SoCal camping for you!). It did not leak, thank the Great Pumpkin. I have to say, I have never been happier on any Halloween. At dawn I woke up to a world soggy and remade. The rain had carved deep channels and rivulets in the hard-packed soil. The scrubby, hard-bitten plants eking out their living on the granite slopes shimmered in the morning light, free of dust for the first time in months, revealing their true and gentle colors. I heard water and ran to the stream bed. The day before it had been dry, now it ran with water. I knew it was a temporary flow, but the sight of running water after a long dry summer brought tears to my eyes, and I remembered that Halloween is the Celtic New Year. It’s a time of darkness, and a time of death (the traditional time for slaughtering stock), but in death there is renewal, and I felt that renewal in the moist loam beneath my feet and the cheerful dripping of the trees, and I heard it in the water, and I gave thanks for the rain. And an hour later, it began to snow.